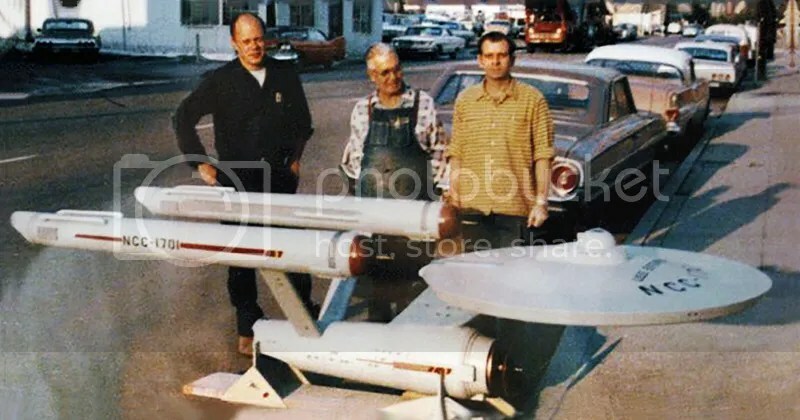 This is a fairly well known photograph of The Original Series ENTERPRISE model and…. I assume…. the model makers who are justly proud of what they’ve built. The Original Series ENTERPRISE is one of the best known icons of Science Fiction. But if you look closely you can also see a minor HORROR movie icon somewhere in this picture. Here is another shot of this moment. 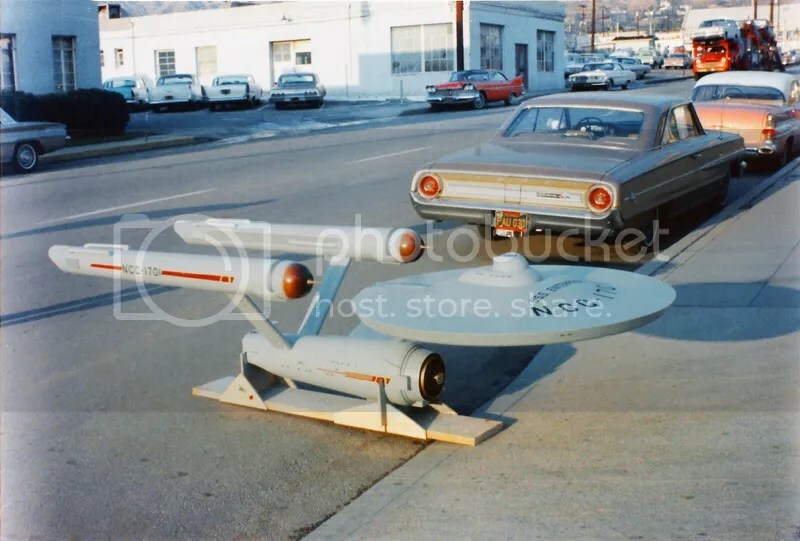 You can see a clearer view of both the Enterprise and …… other iconic vehicle. I have photoshopped the image, brightening it and increasing the saturation, particularly RED. But I haven’t in any way “faked” the picture. This entry was posted in special effects, star trek, Uncategorized and tagged horror, miniatures, model, model shoot, science fiction, special effects, star trek on August 12, 2018 by mattkprovideo. Space: 1999 is a British science-fiction television series that ran for two seasons and originally aired from 1975 to 1977. In the opening episode, set in the year 1999, nuclear waste stored on the Moon’s far side explodes, knocking the Moon out of orbit and sending it, as well as the 311 inhabitants of Moonbase Alpha, hurtling uncontrollably into space. The series was the last production by the partnership of Gerry and Sylvia Anderson and was the most expensive series produced for British television up to that time. The first series was co-produced by ITC Entertainment and Italian broadcaster RAI, while the second series was produced solely by ITC. Two series of the programme were produced, each comprising twenty-four episodes. Production of the first series was from November 1973 to February 1975; production of the second series was from January 1976 to December 1976. The premise of Space: 1999 centres on the plight of the inhabitants of Moonbase Alpha, a scientific research centre on the Moon. Humanity had been storing its nuclear waste in vast disposal sites on the far side of the Moon, but when an unknown form of electromagnetic radiation is detected, the accumulated waste reaches critical mass and causes a massive thermonuclear explosion on September 13, 1999. The force of the blast propels the Moon like an enormous booster rocket, hurling it out of Earth orbit and into deep space at colossal speed, thus stranding the 311 personnel stationed on Alpha. The runaway Moon, in effect, becomes the “spacecraft” on which the protagonists travel, searching for a new home. Not long after leaving Earth’s solar system, the wandering Moon passes through a black hole and later through a couple of “space warps” which push it even further out into the universe. During their interstellar journey, the Alphans encounter an array of alien civilizations, dystopian societies, and mind-bending phenomena previously unseen by humanity. Several episodes of the first series hinted that the Moon’s journey was influenced (and perhaps initiated) by a “mysterious unknown force”, which was guiding the Alphans toward an ultimate destiny. The second series used more simplified “action-oriented” plots. The first series of Space: 1999 used a “teaser” introduction, sometimes called a “hook” or “cold open“. This was followed by a title sequence that managed to convey prestige for its two main stars, Landau and Bain (both separately billed as ‘starring’), and to give the audience some thirty-plus fast cut shots of the forthcoming episode. The second series eliminated this montage. The programme would then offer four ten-to-twelve minute long acts (allowing for commercial breaks in America) and finished with a short (and, in the second series, often light-hearted) “epilogue” scene. In 2004, the American science fiction screenwriter Ronald D. Moore stated the style of the first season’s opening credits of Space: 1999inspired the opening credit sequence for his acclaimed remake of Battlestar Galactica. The headline stars of Space: 1999 were American actors Martin Landau and Barbara Bain, who were married at the time and had previously appeared together in Mission: Impossible. In an effort to appeal to the American television market and sell the series to one of the major U.S. networks, Landau and Bain were cast at the insistence of Lew Grade against the objections of Sylvia Anderson, who wanted British actors. Also appearing as regular cast members were the Canadian-based British actor Barry Morse (as Professor Victor Bergman in the first season) and Hungarian-born, US-raised Catherine Schell (as the alien Maya in the second season). Before moving into the role of Maya during the second series, Catherine Schell had guest-starred as a different character in the Year One episode “Guardian of Piri“. The programme also brought Australian actor Nick Tate to public attention. Roy Dotrice appeared in the first episode as Commissioner Simmonds, and at the end of the episode it appeared that he would be a regular character; however by the second (transmitted) episode the character vanished, reappearing partway through the first season in the episode “Earthbound“, his only other appearance on the show (in which the character is permanently written out). Over the course of its two series, the programme featured guest appearances by many notable actors including Christopher Lee, Margaret Leighton, Roy Dotrice, Joan Collins, Jeremy Kemp, Peter Cushing, Judy Geeson, Julian Glover, Ian McShane, Leo McKern, Billie Whitelaw, Richard Johnson, Patrick Troughton, Peter Bowles, Sarah Douglas, David Prowse, Isla Blair, Stuart Damon and Brian Blessed. (Blair, Damon and Blessed each appeared in two different episodes portraying two different characters.) The English actor Nicholas Young (who portrayed John in the original version of The Tomorrow People) appeared in an episode of Year Two, “The Bringers of Wonder”. Several guest stars went on to appear in the Star Wars films, including Dave Prowse, Peter Cushing, Julian Glover, Christopher Lee, Brian Blessed, Michael Culver, Michael Sheard, Richard LeParmentier, Shane Rimmer, Angus MacInnes, and Jack McKenzie. Space: 1999 was the last in a long line of science-fiction series that Gerry and Sylvia Anderson produced as a working partnership, beginning with Supercar in the early 1960s and including the famed marionette fantasy programmes Fireball XL5, Stingray, Thunderbirds, Captain Scarlet and the Mysterons, Joe 90 and The Secret Service, as well as the live-action sci-fi drama UFO. Space: 1999 owes much of the visual design to pre-production work for the never-made second series of UFO, which would have been set primarily on the Moon and featured a more extensive Moonbase. Space: 1999 drew a great deal of visual inspiration (and technical expertise) from the 1968 Stanley Kubrick film 2001: A Space Odyssey. The programme’s special effects director Brian Johnson had previously worked on both Thunderbirds (as Brian Johncock) and 2001. In 1972, Sir Lew Grade, head of ITC Entertainment, proposed financing a second series of the Century 21 production UFO to show-runners Gerry and Sylvia Anderson. Grade had one stipulation: the new series would be set primarily on the Moon within the environs of an expanded SHADO Moonbase; the ratings indicated the Moon-centric episodes had proved more popular with the viewers. The Andersons and their team would quickly revamp the production, flashing ahead nearly twenty years for UFO: 1999 with Commander Ed Straker and the forces of SHADO fighting their alien foes from a large new Moonbase facility. However, toward the end of its run, UFO experienced a drop in ratings in both America and the UK; nervous ITC executives in both countries began to question the financial viability of the new series, and support for the project collapsed. In the meantime, Production Designer Keith Wilson and the art department had made considerable progress in envisioning the look and design of the new series. Their work was then shelved for the foreseeable future. Anderson would not let the project die; he approached Grade’s number two in New York, Abe Mandell, with the proposal for taking the research and development done for UFO: 1999 and creating a new science fiction series. Mandell was amenable, but stated he did not want a series set featuring people “having tea in the Midlands” and forbade any Earth-bound settings. Anderson responded that in the series opener, he would “blow up the Earth”. Mandell countered that this concept might be off-putting to viewers, to which Anderson replied he would “blow up the Moon”. The Andersons reworked UFO: 1999 into a new premise: Commander Steven Maddox controlled the forces of WANDER, Earth’s premier defence organisation, from Moon City, a twenty-mile wide installation on the Moon. Maddox would view all aspects of Earth defence from Central Control, a facility at the hub of the base and accessible only by Moon Hopper craft, which would require the correct pass-code to traverse Control’s defensive laser barrier. The Commander would also have access to a personal computer called “Com-Com” (Commander’s Computer), which would act as a personal advisor, having been programmed with the Commander’s personality and moral sense. In the half-hour opening episode “Zero-G” penned by the Andersons, Earth’s deep space probes have discovered an advanced extraterrestrial civilisation. Maddox is kidnapped for an interview with the aliens. Angered by humanity’s innate hostility and WANDER’s defensive posture, they travel to Earth with the intent of isolating mankind within the boundary of Earth’s atmosphere. Having judged Maddox a noble example of mankind, they return him unharmed. They then use a beam to reduce the Moon’s gravitational influence to zero, sending it careening out of orbit into deep space. The project continued forward. Group Three Productions (a partnership of the Andersons and production executive Reg Hill) would produce the series; ITC Entertainment and Italian broadcaster RAI would provide the funding. Grade, aiming for a US network sale, insisted the series have American leads and employ American writers and directors. George Bellak, a well-known American television writer, was brought on staff. As stated by series writers Christopher Penfold and Johnny Byrne, it was Bellak who created and polished the series’ defining concepts. Bellak wrote a ninety-minute opening episode titled “The Void Ahead”, which was a close forerunner of “Breakaway“. Bellak also set up a writers’ guide defining the three leads, the facilities of the Moonbase and potential storylines. For the lead characters of John Koenig and Helena Russell, Gerry Anderson approached the husband-and-wife acting team of Martin Landau and Barbara Bain. Landau and Bain were high-profile stars in America after three years on the popular CBS espionage series Mission: Impossible. Producer Sylvia Anderson let it be known that she would have preferred British lead actors; since Grade insisted on Americans, she would have chosen Robert Culp (star of the 1960s espionage series I Spy) and Katharine Ross (co-star of 1960s blockbuster movies The Graduate and Butch Cassidy and the Sundance Kid). Lee H. Katzin, a highly respected American television director with a speciality for pilot episodes, was selected to helm the opening segment and brought into the fold as a primary director for the remainder of the series. The show’s vehicles, including the Eagle space shuttle and the Moon Buggy, were represented with a mixture of full-sized props, photographic blow-ups, and detailed scale models. Dozens of models for the various alien spaceships and the Mark IX Hawk from the “War Games” episode were built by model maker Martin Bower, often at several different sizes to account for the intended use. Rather than relying on the expensive and time consuming blue screen process, as for Star Trek, Johnson’s team often employed a technique that went back to the earliest days of visual effects: spacecraft and planets would be filmed against black backgrounds, with the camera being rewound for each successive element. As long as the various elements did not overlap, this produced convincing results. In technical terms, the advantage was that all of the elements were recorded on the original negative, as opposed to blue screen, which would have involved several generations of duplication. Another plus was that the camera’s exposed negative contained completed effects—once this film was lab processed—thereby avoiding the costly, in time and money, blue screen “optical” technique. The disadvantage was that the number of possible angles was more limited; for instance, a spaceship could be seen approaching a planet from the side, but could not move in front of it without the elements overlapping. Special effects director Brian Johnson and most of his team went on to work on Ridley Scott‘s Alien, followed by The Empire Strikes Back. Space: 1999 used Pinewood Studios sound-stages L and M. Each studio measures 90′ x 105′ (27 m x 32 m), with a floor-to-grid measurement of 30 feet (9 m). For the first series, Stage L housed the “standing sets”; such as Main Mission, the Eagle interior, the travel tube, and a small section of corridor. Due to the limited studio space, other sets depicting Alpha interiors, such as Medical Centre, were assembled as needed. Stage M was the “swing stage” – used for planet exteriors, spaceship interiors, and whatever else was needed for a given episode. The unisex “Moon City” uniforms for the first series were created by renowned Austrian fashion designer Rudi Gernreich, a personal friend of series star Barbara Bain. Other costumes were designed by Production Designer Keith Wilson, who was also responsible for set design. Wilson’s innovative Moonbase set construction, using 4-by-8-foot (120 by 240 cm) plastic foam-board panels, linked together Lego-like into whatever room configuration was required, made for a uniform and realistic appearance for the Alpha interiors (not to mention being relatively cheap and quickly assembled). A muted colour palette and the integration of recognisable equipment and accessories added to the verisimilitude. For the second series, the Moonbase uniforms were updated and coloured decorative stitching and turtleneck collars were added, as were various badges and patches. Red, navy, or dark-green jackets also appeared, originally on just the senior staff, then on many of the male extras. The female characters tended to wear skirts and knee high boots throughout the second series, rather than the flared trousers used in Year One. The costumes for Year Two were designed by Emma Porteous, who later designed the wardrobes for several James Bond films. 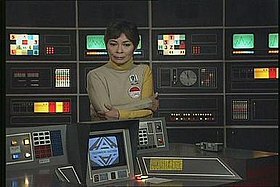 The Moonbase interiors were also upgraded for the second year, with the existing stock of wall panels, doors, computer panels, etc. (along with some bits from other Anderson productions) being assembled for the first time—on Stage L–into a standing complex of interconnected sets (the first series’ sets had been assembled as needed and the size of the Main Mission/Command Office complex was prohibitive for the construction of a lasting series of rooms.) Vibrant colour was much more evident in this series’ Moonbase sets. Gadgets and equipment with a futuristic appearance typical of contemporary science fiction were also more evident. For example, Helena no longer used a stethoscope, but a little beeping, all-purpose medical scanner similar to Dr McCoy’s whistling medical “tricorder” on Star Trek. The opening credits for the first series featured a dramatic fanfare composed by long-time Anderson associate Barry Gray, whose scores for the series were his final compositions for an Anderson production. Gray scored five episodes—”Breakaway“, “Matter of Life and Death“, “Black Sun”, “Another Time, Another Place“, and “The Full Circle” — Vic Elms provided a completely electronic score for “Ring Around the Moon“, and Big Jim Sullivan performed a one-off sitar composition for “The Troubled Spirit“. Library music, classical compositions, and score excerpts from earlier Anderson productions augmented the five Gray scores and gave the impression of an expansive musical repertoire. The second series was scored by jazz musician and composer Derek Wadsworth; American producer Fred Freiberger wanted a more “driving, searing” score for his new action-adventure format. Aside from the new theme music, which was more synthesised than the theme for Year One, Wadsworth also composed original music for the episodes “The Metamorph“, “The Exiles“, “One Moment of Humanity“, “The Taybor“, and “Space Warp“. Much of this music was reused in other episodes. Other Anderson shows influenced the Space: 1999 spacecraft and elements. The cockpit of the Eagle has a slight resemblance to the cockpit of an earlier Anderson Supermarionation series, Fireball XL5. Thruster and engine sounds were similar to those previously used in Fireball XL5, Thunderbirds, and Captain Scarlet. Lighting effects for Moonbase Alpha were comparable to those from UFO, as well as the concept of the elevating spacecraft launch pad. After almost 30 years, the original Moonbase Alpha model reappeared in the public eye online when a site gained exclusive access to photomap the model and solicit its sale. As the November 1973 start date approached, George Bellak fell out with Gerry Anderson over creative issues and left the production. Story consultant Christopher Penfold acted as head writer, bringing in American writer Edward di Lorenzo and Irish poet Johnny Byrne as script editors. Penfold reworked Bellak’s opening episode into a one-hour draft first re-titled “Turning Point”, then finalised as “Breakaway”. One week before live action filming commenced, Visual Effects Supervisor Brian Johnson and his team began work on the visual effects sequences for the first episode at Bray Studios near Maidenhead, Berkshire on 5 November 1973. For the first six weeks, no usable footage resulted until the team discovered a dragging brake[clarification needed] had affected film speed. Studio rehearsals commenced at Elstree Studios near Borehamwood, Hertfordshire on 12 November 1973. During filming of the first episode, it became apparent that the troubled Elstree was under the threat of imminent closure. One weekend, the company secretly relocated sets, props, costumes, etc., to the nearby Pinewood Studios at Iver Heath, Buckinghamshire, resulting in a union blacklisting of the production. Scheduled for ten days’ filming, “Breakaway” overran an additional fifteen days. Lee Katzin was a perfectionist and demanded take after take of scenes; even coverage of reaction shots of the background extras required running a whole scene from beginning to end. His two-hour director’s cut was assembled and sent to ITC New York for a viewing. Abe Mandell was horrified by the finished product. Anderson re-wrote several key scenes and, after three days of re-shoots, re-edited the pilot into a one-hour episode that appeased the fears of ITC. Katzin was not asked back to the programme after the filming of his second episode “Black Sun”, which also ran over schedule. Scheduled for a twelve-month shoot, the twenty-four episodes took fifteen months to complete, with the production experiencing a number of difficulties. Britain’s mandatory three-day work week and the unplugging of the National Grid during the coal shortages due to industrial unrest of the early 1970s did not delay filming as Pinewood had its own generators, but it affected film processing as the lab was an off-site contractor. Group Three’s commitment to its financial partner, RAI, to include Italian actors in the cast also had to be addressed. Originally, two supporting roles were intended for Italian actors; with the casting of Nick Tate and Zienia Merton in those roles, a solution had to be worked out. Four of the later episodes produced (“The Troubled Spirit“, “Space Brain“, “Dragon’s Domain” and “The Testament of Arkadia“) featured Italian guest artists. The necessity to telex story outlines and scripts to New York for approval caused further production delays. The incessant re-writing this brought about eventually caused Christopher Penfold to resign during the shooting of “Space Brain“, after completing his writing commitment with the script “Dragon’s Domain“. In a later interview, Johnny Byrne stated that “one episode they (New York) would ask us to speed things up, forcing us to cut out character development; then the next episode, they asked for more character moments, which would slow down the action; then they would complain there weren’t enough pretty girls in another.” Years later, Byrne and Penfold would agree that the process they worked under made “good scripts less than they had been” and forced them to waste time re-writing “bad scripts to make them acceptable”. Byrne remained until the end of production; his last task writing filler scenes for the desperately short “The Last Enemy” and a re-shoot for the troublesome “Space Brain“. The scenes re-mounted for “The Last Enemy” concluded principal photography on 28 February 1975. Countries where the show was popular include France, Italy, Yugoslavia, Poland, Ethiopia, South Africa, Turkey, Iran, Greece, the Netherlands, Belgium, Portugal, Peru, Japan, Malaysia, Canada, Mexico, Philippines, Singapore, South Korea and Taiwan. One of the first previews of the series was in Australia on the Seven Network in July 1975, but the station later split the first series into two seasons. The second season was shown in 1979. Response to the series varied; some critics praised it as a classic, citing the production values and multi-layered storytelling (“Space: 1999 is like Star Trek shot full of methedrine. It is the most flashy, gorgeous sci-fi trip ever to appear on TV…” and “Space: 1999 is a visually stunning, space-age morality play…”); others panned it for poor plotting and wooden acting, especially on the part of Barbara Bain (“the plots and characterisation on Space: 1999 have been primitive…” and “A disappointing collage of wooden characters, boring dialogue and incomprehensible plots…”). Isaac Asimov criticised the scientific accuracy of the series by pointing out that any explosion capable of knocking the Moon out of its orbit would actually blow it apart, and even if it did leave orbit it would take thousands of years to reach the nearest star. He did, however, praise the programme for the accuracy of the representation of movement in the low gravity environment of the Moon, and for its realistic production design (Asimov’s responses were based on the pilot episode only). Subsequent episodes (such as “The Black Sun”, third in production order, and “Another Time, Another Place”, sixth in production order) suggest the Moon reaches the stars by passing through wormholes and hyperspatial tunnels, a plot point made more overt in second-season episodes, notably “The Taybor” and “Space Warp”. This issue is left somewhat enigmatic in the first season as episodes involving other planets invariably begin with the Moon having already reached a planet and in the first few episodes of this kind, such as “Matter of Life and Death” and “Missing Link”, the episodes actually begin with the Alphans on their way back from a planet, an initial Eagle flight having taken place before the episode even begins. Gerry and Sylvia Anderson were surprised and disappointed that the public (and critics) never granted them the suspension of disbelief given to other science-fiction programmes. The characters seem aware of the apparent implausibility of their situation. In “Black Sun”, Victor Bergman asserts the chances of their surviving the explosion which knocked them from orbit are “just about infinite.” In “Matter of Life and Death”, Koenig remarks “many things have happened since we broke away from our own solar system, unexplainable things.” How they survived and are able to travel the Universe seems to be a central mystery to which the Alphans, and the audience, have no concrete answers. Following the completion of the first series, the production team prepared for a second series to commence production in the autumn of 1975. Gerry Anderson had staff writer Johnny Byrne prepare a critical analysis of the first twenty-four episodes, assessing their strengths and weaknesses in order to mount a new and improved second year. Byrne then commenced writing scripts in an improved first-series format: “The Biological Soul”, “The Face of Eden”, and “Children of the Gods”. He engaged British writer Donald James to develop his first-series format story “The Exiles”. The largest stumbling block for the staff had been having all material vetted by ITC’s New York office. ITC’s compromise was to hire a high-profile American staff writer-producer. At this time, Sylvia Anderson left her role as producer when she and Gerry Anderson formally separated (and subsequently divorced). Fred Freiberger, whom Gerry Anderson had considered for the writing position, was then brought on board to help guide the series as a producer and acted as show-runner. Freiberger had produced the third and final season of Star Trek in 1968–1969 and eight episodes of the first season of The Wild Wild West (including one in which Martin Landau guest-starred) before being dismissed. Immediately after Space: 1999he would go on to produce what would be the final season of The Six Million Dollar Man. His writing credits included Slattery’s People, The Iron Horse, All in the Family, Petrocelli, and Starsky and Hutch. Though Anderson and Grade were satisfied with this choice, Abe Mandell had concerns about why he was unemployed and available at the time. Then ITC Entertainment President Sir Lew Grade abruptly cancelled the series’ production in late 1975, when ratings in the United States had dropped during the later autumn months of the year. Grade had already been disappointed by the lack of an American network broadcast sale. Gerry Anderson and Fred Freiberger rallied and pitched the idea of a new series with the addition of an alien character to Moonbase Alpha, who would shake up the dynamic of interaction on the Moonbase and regain viewer interest in the United States. On the strength of Anderson and Freiberger’s proposal of adding an alien character from the planet Psychon named Maya, Mandell approved a renewal of the series for a second year. In addition to the alien Maya character, to be played by Catherine Schell, numerous other changes were made for what was branded Year Two. The most visible change was the absence of Professor Bergman (Barry Morse). Morse’s departure was due to a salary dispute, but he later claimed that he was glad to leave, and he had told Anderson: “I would rather play with grown-ups for a while.”  With Morse gone, the role of the boffin on Alpha was filled completely by Maya, whose people’s science was far in advance of mankind’s. Also, her character was conceived to be able to provide “outside observation of human behaviour” as had been provided by the character of Mr. Spock on Star Trek. Maya shared Spock’s logical approach to problem-solving and advanced intelligence, but differed in that she was a charming, fully emotional person. Most importantly, however, her Psychon abilities as a metamorph with the power of “molecular transformation” allowed her to convert herself into any living thing for an hour at a time, were designed to add a certain “wow” factor to the newly revamped series. Maya had an impish sense of humour. When love-interest Tony Verdeschi offered her some of his home-brewed beer, Maya tried it, then turned herself into Mister Hyde. Schell had previously guest-starred as the Servant of the Guardian in the Year One episode “Guardian of Piri“. In addition to the cosmetic changes, the characters were “warmed up.” Koenig and Russell went from a barely noticeable courtship to a physically passionate, full-fledged romance, in which the devotion ran so deep that they offered to die for each other (“Brian the Brain”). In addition to Bergman, Year One supporting characters Paul Morrow (Prentis Hancock), David Kano (Clifton Jones) and Tanya Alexander (Suzanne Roquette) were also removed from the cast (Paul and Tanya’s disappearance is explained in the Powys Media book The Forsaken by John Kenneth Muir). Dr Bob Mathias (Anton Phillips) was present in the first two Year Two episodes, was mentioned in the third episode, and then also disappeared without a trace. His character was replaced by several recurring physicians. Alan Carter (Nick Tate) was to have been written out of the series, but he had become so popular with fans that he remained. Sandra Benes (Zienia Merton) remained with the series in an on-again off-again association, but the character only appeared in a fraction of the episodes, albeit more prominently in some than in many of those of the first series. Security Chief Tony Verdeschi also joined as a new character, played by Tony Anholt. Verdeschi, who assumed the base’s second-in-command role, neither appeared, nor was ever mentioned, in Year One. However, Moonbase Alpha personnel treated Verdeschi as if he had been in their midst since “Breakaway”. His character was designed to serve primarily as a secondary male action hero, and became a romantic interest for Maya. No on-screen explanations were offered for the cast changes. One scene in “The Metamorph” mentioning Bergman’s death was scripted and filmed, but cut from the final edit. The Moonbase Alpha Technical Manualproduced by Starlog magazine picks up this explanation, stating Bergman died due to a faulty spacesuit per the scripted scene. Likewise, it was mentioned in this publication that Morrow and Kano had died in an Eagle crash between seasons, and explained that Dr Mathias, supposedly Alpha’s psychiatrist (although he seems to be more Russell’s assistant) was on sabbatical doing research. Fred Freiberger felt that these characters were one-dimensional and had no fan support; he told Nick Tate that the audience would not remember them and that, as far as he was concerned, they were just “somewhere else” on Alpha, lost in the crowd of three hundred other people. Freiberger failed to appreciate the value of the supporting characters to the show and its fans. Other changes included the main titles and theme music. Year One’s opening montage of events from “Breakaway” and the episode about to unfold was dropped in favour of a special-effects sequence depicting the Moon being blown out of orbit into space. With Morse gone, Schell was featured in his place as a regular alongside Landau and Bain, and all three were depicted in action-oriented images as opposed to the mannequin-like stances Landau and Bain had assumed in the Year One main titles. New series composer Derek Wadsworth‘s new theme dropped Barry Gray‘s alternation between stately, orchestral passages and funky rhythmic ones in favour of a more consistently contemporary piece. Rudi Gernreich‘s minimalist costume was considerably modified from the original unisex design to include an optional skirt and leather boots for women and much more detail work on the tunic portion, including turtleneck collars, coloured stitching, patches and photo ID badges. In addition, colourful jackets (generally red, blue or green) became part of most characters’ ensembles. The sombre mood created in Year One by the effective use of light and shadow in the filming of Moonbase Alpha interiors was abandoned in favour of a generally brighter cinematography, and even the lettering used in signage and costuming—most noticeable on spacesuits and Eagle Transporter doors—changed to a simpler, less futuristic style. Production Designer Keith Wilson stated in an interview in Destination: Moonbase Alpha that he was always being ordered by Producer Fred Freiberger to make sets smaller, taking away the expansive (and expensive) look of the first series’ interiors. Freiberger was very budget-conscious and, despite press releases to the contrary, the production team was working with less money this series. If there had been a budget increase, the ‘stagflation‘ economy of the seventies would have cancelled it out. When interviewed, many of the actors state they were asked to accept less money, including Landau and Bain (who were the only ones with enough clout to be able to refuse). Freiberger emphasised action-adventure in Year Two stories to the exclusion of metaphysical themes explored in Year One. Of Year One, he commented, “They were doing the show as an English show, where there was no story, with the people standing around and talking. In the first show I did, I stressed action as well as character development, along with strong story content, to prove that 1999 could stand up to the American concept of what an action-adventure show should be.” Since Year One was quite serious in tone, one of Freiberger’s ways to accomplish this objective was to inject humour into Year Two stories whenever possible, but much of it seemed to the more vocal fans to be forced, especially at the conclusion of an episode, where the Alphans were seen as jovial and light-hearted despite whatever violent or tragic events might have previously befallen them. Freiberger had appropriated this approach from Star Trek; the endings of many of that show’s episodes featured an upbeat discussion among the cast of the lessons learned during the episode and closing on a joke; this approach was copied for Space: 1999 with Koenig, Verdeschi, Russell, Carter and Maya enjoying a laugh in the Command Centre. Given Landau’s intensity and the brooding nature of the Koenig character, the approach did not fit the series. Members of the Space: 1999 cast were disenchanted with the scripts. Martin Landau: “They changed it because a bunch of American minds got into the act and they decided to do many things they felt were commercial. Fred Freiberger helped in some respects, but, overall, I don’t think he helped the show, I think he brought a much more ordinary, mundane approach to the series.” One particular episode (‘All That Glisters‘, which dealt with the threat of an intelligent rock) was of such allegedly deficient quality that it sparked a confrontation between Freiberger and the cast. Landau disliked the story so strongly that he wrote the following notes on his copy of the script: “All the credibility we’re building up is totally forsaken in this script.”; “…Story is told poorly.”; and “The character of Koenig takes a terrible beating in this script — We’re all schmucks.” Anholt revealed that, “the more the cast complained about a script’s flaws, the more intractable and unyielding Freiberger became.” Dissatisfaction on Landau’s part about scripts was not new to Year Two, though. Sylvia Anderson remembers that he often voiced criticisms of scripts during production of the first series. With the last-minute renewal from Grade, the production team hit the ground running. Byrne’s script “The Biological Soul”, involving the Alphans’ encounter with the unstable Mentor of the planet Psychon and his biological computer Psyche, which drew sustenance from the mental energy of intelligent beings, was re-written to include the new character Maya and the rest of the format changes. Production began on 26 January 1976 and was scheduled to last a mere ten months due to the already-late renewal order. To fulfil the scheduling requirement, Freiberger came up with the “double-up script” solution. During “double-up” instalments, two first-unit production teams would film two episodes simultaneously. Landau and some of the supporting cast would be given expanded roles and would film an episode on location or on sets constructed for that story in Pinewood’s Soundstage “M”, while Bain and the remaining supporting cast (also in expanded roles) would film their episode in the standing Alpha sets on Soundstage “L”. Landau and Bain would then be given minor roles in the opposing episodes. This cost- and time-saving measure was used to complete eight stories as four pairs: “The Rules of Luton” and “The Mark of Archanon“; “The AB Chrysalis” and “Catacombs of the Moon“; “A Matter of Balance” and “Space Warp“; “Devil’s Planet” and “Dorzak“. A ninth episode, “The Beta Cloud“, was intentionally scripted with only one day’s worth of work for Landau and Bain to allow their planned holiday to the French Riviera not to delay the series’ production; the four supporting cast members (Schell, Anholt, Tate and Merton) were the recipients of much greater than usual exposure. Relations between new producer Freiberger and the Year One veterans were strained. Landau complained about stories he felt were light-weight or absurd when compared to the previous year’s efforts. He wrote on the cover of a script: “I’m not going out on a limb for this show because I’m not in accord with what you’re (Freiberger) doing as a result … etc. I don’t think I even want to do the promos—I don’t want to push the show any more as I have in the past. It’s not my idea of what the show should be. It’s embarrassing to me if I am not the star of it and in the way I feel it should be. This year should be more important to it, not less important to it … I might as well work less hard in all of them.” Johnny Byrne said that Freiberger was a good man and good producer, but not good for Space: 1999. He had gotten them a second year after the cancellation, but the changes he made did not benefit the programme. The producers and studio intended to continue the show with a third season. This was to be shorter than the previous two, with 13 episodes, for budget reasons. Maya was considered to be a successful character, and the producers began grooming her for a spinoff show that would run concurrently with the third series of Space: 1999. Had this project gone ahead, Maya would have been absent from Space: 1999. The “Maya” series was also intended to run for 13 episodes a year. As filming on Year Two came to its conclusion, it became apparent that there would be no third season, and the series ended with the episode “The Dorcons“. The series premiered in September 1975, on the ITV network but was not simulcast nationally (this remained the case until a repeat airing on BBC2in 1998). Most ITV regions (including Yorkshire, Grampian, Ulster, Scottish, Border, ATV, and Tyne Tees) premiered the series on Thursday, 4 September 1975 in a 7.00pm slot. The London and Anglia regions screened the first episode two days later on Saturday, 6 September at 5.50pm. The Granada region began showing the series on Friday, 26 September 1975, initially at 7.35pm before moving to 6.35pm a few weeks later. The HTV region did not begin showing the series until October 1975, again in an early Friday evening slot. However, within a few weeks, various stations had moved the series elsewhere in their schedules. The second series premiered on London Weekend Television (LWT) in a non-prime-time slot on Saturday 4 September 1976 at 11.30am, with ATVfollowing on just a few hours later at 5.40pm. Granada, Westward and Ulster started to screen the series in early 1977, Grampian, and Tyne Tees did not screen the series until later in the year. Scottish started to screen the series on 9 April 1978 on Sunday afternoons. HTV did not pick the series up until 1984 and then only showed nineteen out of the twenty-four episodes from Year Two (the last episodes were not screened in Wales until the series was repeated in the 1990s). Southern Television was the other ITV region known not to have broadcast series two. Even its successor broadcaster, Television South, failed to screen any series two episodes when Space: 1999 was reshown in various other ITV regions between 1982 and 1985. In the United States, efforts to sell the series to one of the three networks for the 1974–75 or 1975–76 television seasons failed. The networks were uninterested in a project over which they had no creative control, being presented with the accomplished fact of twenty-four completed episodes. Abe Mandell of ITC had secured a ‘handshake’ agreement with a network executive in 1974, but after the man’s termination, all his projects were abandoned. Undaunted, Mandell created what he called his own Space: 1999 Network and sold the completed program into first-run syndicationdirectly to local stations. Much of the publicity mentioned the then-staggering three million pound budget: as a part of the American promotion effort, a glossy magazine-sized brochure was produced, touting Space: 1999 as the Six-and-a-Half Million Dollar Series (an allusion to the then-popular American programme The Six Million Dollar Man) featuring American stars, American writers and American directors. In the months leading to the beginning of the fall (autumn) 1975 television season Landau and Bain participated in special preview screenings in select cities. Landau is said to have personally contacted editors of the widely read and influential TV Guide magazine in some markets to secure coverage of Space: 1999 in its pages upon learning of ITC’s somewhat poor promotional efforts. While most of the U.S. stations that aired Space: 1999 were independent (such as powerful Chicago station WGN-TV, Louisville station WDRB-TV, Los Angeles station KHJ-TV, and New York City’s WPIX-TV), a handful were affiliated with the major networks (such as Charlotte, North Carolina’s WSOC-TV, at the time a strong NBC affiliate, and Fresno’s KFSN-TV, at the time a CBS affiliate) and sometimes pre-empted regular network programming to show episodes of the series. Most U.S. stations broadcast episodes in the weekday evening hour just before prime time or on weekends. In Canada, CBC Television was the broadcaster of Space: 1999 from 1975 into the 1980s. The first season in 1975–76 was shown regionally on some CBC owned-and-operated stations, the airtime varying. With the start of the second season in September 1976, CBC Television upgraded Space: 1999 to full-network status, airing it Saturdays on all CBC owned-and-operated stations, with affiliated, privately owned stations also offering the show on Saturdays. Most of the country saw Space: 1999 at 5 p.m. on Saturdays, a notable exception being the Atlantic Provinces in which it was broadcast at 6 or 6:30 p.m. (their time) or – as was the case in the summers – sometime earlier in the afternoon to accommodate live sports coverage, the airing of which crossed into or totally over the usual Space: 1999 airtime. After the 1976–77 broadcast year (in which second-season episodes were run and rerun), the show’s ratings were sufficiently high for CBC Television to give the first season a full-network airing – and with further repeats – from 1977 to 1978. The French-language CBC Television, Radio-Canada, showed Cosmos: 1999 several times (both seasons) between 1975 and 1980, first on Mondays (1975–1976), then on Saturdays (1976–1977), then on Mondays (1979), and finally on Wednesdays (1979–1980). The series fared admirably on CBC Television in Canada, airing in English in a family viewing period, late Saturday afternoons before hockeybroadcasts, with a mostly un-disrupted run and rerun of all 24 episodes from September, 1976 through September, 1977. The French version was also broadcast, in early evening on Saturdays. Ratings were sufficient for a full additional year’s transmission of Year One in the English CBC Saturday programming slot in 1977 and 1978. Episodes of both Year One and Year Two were repeated regionally in Canada in English and French through the early-to-mid-1980s. YTV Canada broadcast both seasons with reportedly good ratings from 1990 to 1992, in a late Saturday afternoon airtime closely matching that of the CBC English network in the 1970s. The full-network English CBC airing began with the series opener, “Breakaway“, on 11 September 1976, then “The Metamorph“, the Year Two opener, on 18 September. “The Exiles“, “Journey to Where“, “The Taybor“, and “New Adam, New Eve” followed respectively in the subsequent weeks. Next were “The Mark of Archanon“, “Brian the Brain“, “The Rules of Luton“, “The AB Chrysalis“, “Catacombs of the Moon“, and “Seed of Destruction“. “Seed of Destruction” aired on 27 November, and then with December there came a month of repeats. And after a pre-emption for New Year’s Day sports, new episodes resumed airing on 8 January 1977 with “A Matter of Balance“, followed by “The Beta Cloud“, “One Moment of Humanity“, “The Lambda Factor“, “All That Glisters“, and “The Seance Spectre“. The two-part episode, “The Bringers of Wonder”, was shown on 19 and 26 February. And then “Dorzak“, “The Immunity Syndrome“, “Devil’s Planet“, and “The Dorcons” followed in March. “Space Warp” would not be shown until 21 May, after many weeks of repeats. By 10 September 1977, except for “The Exiles”, all of the second-season episodes had been repeated. And thereafter, a 1977–1978 run of first-season episodes began with “War Games” on 17 September. In Finland the first season was originally aired by the commercial MTV (Mainostelevisio) channel in 1976, but it was withdrawn after couple of episodes on demand of the national programme board as the show was considered too brutal and horrifying. The same thing happened when MTV tried to air the second season in 1978. The complete show wasn’t seen in Finland until 1996-1997 when a small local channel, TV-Tampere, aired it. Since then it aired on TVTV! in 2000 and 2001, and later on MTV3 Scifi in 2008. In Romania, the series has been shown on Prima TV. It was shown in Italy as Spazio 1999 , Argentina, Uruguay, Puerto Rico, Dominican Republic, Guatemala, francophone Canada, and France as Cosmos: 1999, Denmark as Månebase Alpha, Brazil and Portugal as Espaço: 1999, Germany as Mondbasis Alpha 1, Sweden as Månbas Alpha, Poland as Kosmos 1999 (1977–1979), Finland as Avaruusasema Alfa, Greece as Διάστημα 1999, Hungary as Alfa Holdbázis, Spain, Chile, Venezuela, and Colombia as Espacio: 1999, Mexico as Odisea 1999, Iran as 1999 سال , Turkey as Uzay 1999 and South Africa as Alpha 1999(1976, dubbed into Afrikaans). The series was also broadcast in New Zealand and Australia. Fan and critic responses to the new series varied. Some missed the mystical plotlines, feature-film ambiance and the “British-ness” of the first series. Others said they enjoyed the new characters, down-to-earth characterisations and action. Comparisons with Star Trek were used by both camps to show how the series had been either saved or destroyed by the format change. Reviewing the show as a whole, science fiction historian John Clutedescribed Space: 1999 as “visually splendid” but criticised what he regarded as the show’s “mediocre acting” and “rotten scripts”. Message From Moonbase Alpha (premiered 13 September 1999), starring Zienia Merton as Sandra Benes. Filmed on 29 August 1999, Message From Moonbase Alpha is a fan-produced mini-episode made with the co-operation and involvement of Space: 1999 script editor Johnny Byrne, who penned the script. Filmed inside a private house on a remarkable working replica of a small section of the Main Mission set and utilising the original prop of Koenig’s Command Centre desk and Sandra Benes‘s original Year Two Alpha uniform, the short film was first shown at the Space: 1999 Breakaway Convention in Los Angeles, California on 13 September 1999—the day the events in episode 1 of the series were supposed to take place. With the permission of (then) copyright owners Carlton Media International, the film included brief clips from seven episodes to illustrate the deserted Moonbase Alpha and the Alphans’ exodus to planet Terra Alpha. Previously unused footage shot for the Year Two title sequence and The Last Enemy was used to create a sequence showing the Moon being affected by a gravitational disturbance and thrown into an unknown solar system. Short excerpts from 12 other episodes appeared in a montage as Sandra Benes recalls her life on Alpha. The seven-minute film features Zienia Merton reprising her role as Sandra Benes delivering a final message to Earth as the only crew member left on Moonbase Alpha while a massive exodus to a habitable planet, Terra Alpha, takes place with the rest of the crew. The evacuation was also necessitated by the degradation and decay of Alpha’s life support systems. This basically gave the series the conclusion that it never had in its initial run. Taking place twenty five years after the events of “Breakaway”, Commander Koenig and Maya are mentioned during Sandra’s message. It concludes with the termination of the message as Sandra closes down Alpha’s operational systems and transmits the message- which turns out to be the mysterious signal received shortly before the events of “Breakaway”. Modified versions of Message From Moonbase Alpha are available on the Space: 1999 Bonus Disk in the U.S. and Canada, and on a DVD bonus disc in France and in Italy. The original version appears as a bonus feature on the Space: 1999/UFO – The Documentaries DVD produced by Fanderson. Around the same time ‘Message From Moonbase Alpha’ was being filmed, Johnny Byrne and Christopher Penfold attempted to revive the franchise as a movie series, similar to the way Star Trek had been revived cinematically in the late 1970s. The first film would have picked up the story several years after the series ended, and would have featured a heavily redesigned Moonbase Alpha. Ultimately the project failed, and nothing came of it. The series was released on home video in the 1990s, with each cassette (or “volume”) featuring two episodes. In 2001, it was released on DVD in the UK by Carlton Media, both in single disc volumes (each volume contained four episodes) and also as two complete season boxed sets (titled as “Year One” and “Year Two”) comprising six discs each. Each DVD also contained various extra features, including a variety of archive production material, memorabilia, and interviews with the cast and crew from the time the series was being made. In 2005, Network DVD re-issued Year One in the UK as a Special Edition seven-disc box set. For this release, to coincide with the series’ 30th Anniversary, each episode was digitally restored by creating new 35 mm film elements (a new interpositive made from the original negative which is then used to make further copies). High Definition digital transfers were then made from the interpositives using a state-of-the-art Philips Spirit DataCine. This vastly improved the picture quality in comparison to the previous DVD releases, however the restoration process has actually made some of the space scenes (that involve special effects and model work) less realistic due to increased brightness and contrast (a comparison can be viewed here ). This box set also included two booklets and a new set of extra features that were not on the Carlton DVD releases, including featurettes on “Concept & Creation” and “Special Effects & Design” (edited from an earlier “Fanderson” documentary made in 1996), textless and alternative opening and closing title sequences, a two-part Clapperboard special on Gerry Anderson from 1975, and also a brand new 70-minute documentary entitled “These Episodes” in which Anderson, Christopher Penfold, Johnny Byrne, Zienia Merton and David Lane reflect on the making of key episodes from the first series. Network DVD released Year One on Blu-ray in the UK on 1 November 2010, and simultaneously re-released their Special Edition DVD box set of Year One with new cover artwork at the same time. The Blu-ray set includes all of the extras on the 2005 Network DVD release as well as some of the extras that were on the 2001 Carlton DVD release (including a Lyons Maid ice-lolly commercial, and an SFX segment from the British documentary series Horizon). It also includes several new extras including a “Memories of Space” featurette, a Sylvia Anderson interview (in which she frankly discusses the series and her thoughts about Landau and Bain), an expanded version of the “These Episodes” documentary from the DVD set, several PDF files containing scripts and annuals, an extensive set of photo galleries with hundreds of stills, and the first episode of Year Two, “The Metamorph”, in digitally restored hi-definition. Network DVD began a similar restoration process for Year Two in 2007, however progress was slow due to higher production costs in comparison to remastering Year One (the audio for Year One was already digitised prior to Network’s restoration, but Year Two was not). In late 2014, Network finally announced that Year Two would be released in 2015. As part of this announcement, Network released a limited edition (of 1999 copies) of a special preview disc of the two-part story “The Bringers of Wonder” on 8 December 2014. This release also contains a restored version of the feature length Destination: Moonbase Alpha film. The remastered Year Two was eventually released on Blu-ray and DVD in September 2015, to coincide with the series’ 40th Anniversary. Again containing a wealth of extra features, the sets include galleries, vintage interviews, a blooper, behind the scenes footage, original source audio recordings, scripts and annuals PDF files, a stock footage archive, a textless opening title sequence, trailers and promos, “music only” options for all episodes, a stop-motion fan film from 1979, and a specially re-edited/rescored version of the episode “Seed of Destruction” as if it were made for Year One. A&E Home Video has released the entire series on DVD in Region 1. It was initially released in 8 sets with 6 episodes each in 2001 and 2002. On 24 September 2002, a 16-disc “Mega Set” box set featuring all 48 complete, uncut, digitally remastered and restored original broadcast episodes of the series was released. On 31 July 2007, A&E released Space: 1999 – Complete Series, 30th Anniversary Edition. This is essentially the same as the 2002 “mega set” release (and does not use the 2005 hi-def remasters), but does includes a special bonus disc full of extra features. Year One was released on Blu-ray in the U.S. on 2 November 2010 by A&E Home Entertainment. The series has been translated into other media. Originally, all the episodes had been adapted in novelisations, except, for some reason, “Earthbound” (though this may be because E.C. Tubb was working from a different script of “Breakaway” in which Commissioner Simmons was killed when the Moon was torn out of Earth orbit) and “The Taybor” (from Year Two). The authors of these works wrote a number of original stories and have since written new stories and novels which were published after 1999. As well, the original authors participated in the revised versions of their original novels. At the time of the series’ original run, several comic book series were published and, in the US, a series of audio adaptations were recorded on record albums with the younger audience in mind. After 1999, many of these original comic book stories were revised and reprinted along with new stories. See the list above. Mattel created a line of Space: 1999 toys to tie into the TV series, including the Eagle 1 Spaceship. Released in 1976, the Eagle 1 is over 2.5-feet long and a foot wide. The Eagle 1 is made mostly of molded plastic and has a number of parts and accessories. This entry was posted in animation and tagged barbara bain, documentary, gerry anderson, martin landau, science fiction, SPACE 1999, television on October 19, 2017 by mattkprovideo.